I wanted to be an astronaut since I was little. I followed all the Mercury, Gemini and Apollo launches; clipping news items and storing them in a banana box I got from the local grocery. I noticed there were no female US astronauts, but the Russians sent up Valentina Vladimirovna Tereshkova in 1963 to become the first woman and first civilian in space. The US couldn’t be far behind, right? Then NASA scrubbed the Mercury 13 project (First Lady Astronaut Trainees or FLATs.) It was clear that no woman need apply to that boys’ club. Disappointed, I still hoped. I was only eleven, still time to change the boys’ minds and let me play. As the years passed, I realized that dream–for me–was not possible. More and more women burst through glass ceilings and the “firsts” piled up. Finally in 1978, NASA cracked. The shuttle program needed more than cowboy “right stuff.” They needed scientists and engineers. Thirty-five new astronauts were selected–six of them female. But it was to be over twenty years after Tereshkova before an American woman went into space. I still remember being choked with pride and longing when Sally Ride soared into the blue sky over Cape Canaveral–and history–on June 18, 1983 aboard the Challenger Shuttle. I also remember the degrading questions about personal hygiene asked by the media in the pre-launch interview and the tasteless jokes about matching shoes and purse by late night comedy hosts. Sally handled them with grace and aplomb. As more women flew into space, thankfully, those insults passed. Sally retired from NASA in 1987 after two space flights and took up the challenge of inspiring girls and women to enter science and engineering fields. It’s been a hard slog. As of 2009, the U.S. Department of Commerce reports that although women make up half of the college-educated workforce, they hold only 24% of all jobs in science, technology, engineering and math (STEM jobs.) They speculate the causes are, “a lack of female role models, gender stereotyping, and less family-friendly flexibility in the STEM fields.” Sally was a role-model and more. She founded Sally Ride Science in 2001 to create innovative classroom materials, classroom programs, and professional development training for teachers in math and science. She co-wrote seven science books for children (six with her long-time partner Tam O’Shaughnessy) and directed NASA-funded outreach programs to girls and boys in middle-school. I have stars in my eyes. I scan the sky for Echo, a silver orb spinning through the dark. By day I hide under my desk from the menacing mushrooms. I have hope in my heart. I watch the pictures from the moon, imagining a future bright with promise. Flag-shrouded boxes stream home; students die. The weight bows my shoulders. There are no more rockets, no more footprints on the moon. We take back the night, but not the sky. Graceful birds circle the shining globe carrying their fragile human cargo. Others die of hunger and bombs in ancient struggles for life and dignity. I choke on my sobs. We stand still for years and mourn our mangled dreams. Seven brave people lost in fire and water. People are without food, in a world of poisons. They lift their eyes to the stars and find the night filled with spies. Planes, towers and bodies fall from the sky. Wounded warriors and flag-draped boxes stream from distant shores. I let out a long sad sigh. Atlantis landed, shuttered sheds, astronauts on Russian rockets. The children who carry on, will they have stars in their eyes? Thanks for a beautiful and much deserved tribute to a great woman. Beautiful tribute. I remember her flight and how proud I felt to be a woman. I have a “historic” question for you Faith … 🙂 In your opinion, who’s the most important/magnificent woman that ever lived on this Earth so far (present days included)? Thanks, Xenonisis. I checked out your blog and we do, indeed, have a lot in common–added you to my blogroll, as well. As to your question, I find it impossible to answer. So many women are/were important/magnificent in so many areas: science, mathematics, politics, arts and literature. Who impacted the most people for good or ill? Hypatia, of course, and all her daughters from the women philosophers who followed her to more modern women like Ada Lovelace who is considered the first computer programmer and Mileva Maric, Einstein’s wife (she did his math–he was never very good at it) and Marie Curie (no need to identify her accomplishments) to the myriad scientists and mathematicians working today. Strong/important leaders are everywhere from the best known like Cleopatra, Eleanor of Aquitaine, Elizabeth I, Catherine the Great to lesser known but equally important ones like Galla Placidia and her niece Pulcheria who ruled the Western and Eastern Roman Empires during half of the 5th Century. My favorite modern political woman? Hillary Rodham Clinton, hands down. And thanks for chiding me about writing more on my blog. I’ve been very remiss this year and hope to do better. Next up, another History in the News, as well as a guest author. Best of luck with your own blog! Eleanor of Aquitaine has always been a favorite of mine, but many folks have written about her, both biography and fiction, so I’ve left her to others and explored lesser known women. As to Simone de Beauvoir, I read her work years ago and still have my feminist writer collection featured prominently on my bookcase. I should reread some of those and see how they stand up in today’s world. I just finished When Everything Changed: The Amazing Journey of American Women from 1960 to the Present by Gail Collins. Quite nostalgic for me as I (re)lived those times. Women have come a long way, which makes the current conservative agenda in the US trying to roll back equal pay, choice, and education so frustrating! Thanks, Xenonisis. Hope you enjoy Selene and I wouldn’t want anything other than an unbiased review! This is such a nice tribute! 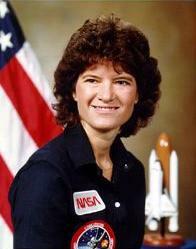 Sally Ride was such a phenomenal person and definitely one to look up to!